Can you believe a third of 2008 has gone already? What a relief we’ve got the winter behind us and we can look forward to warmer times ahead. The daffodils have had a bumper crop and the grass is definitely growing which is good news for eggs because all this extra chlorophyll in your chicken’s diet will give their yolks a glorious deep colour. The clocks went forward and all of a sudden it’s light in the morning and in the evening, which makes you wonder why they bother to put them back in the first place. Anyway the extra daylight hours are great for chickens too and if they have had a break from laying over winter, or not even started yet, they will soon feel the urge. Chickens that are already laying will become more regular and pretty soon you should be enjoying an egg a day from each hen. Omlet celebrated Easter with a huge easter egg hunt – apologies if you couldn’t get through on the phone but when there’s chocolate hidden about the office the customer service team are not to be distracted. In fact Jan is convinced that there are still several eggs to be found in difficult to reach places. Will, Simon, James Robinson, Helen, and Els didn’t need to feel guilty about eating masses of Easter eggs because the week before they took part in Sport Relief . The conditions for the run were much worse than expected, but they were not beaten; they fought through wind, rain and mud to conquer the course. Instead of spending a lazy Sunday morning in bed, eating boiled eggs and keeping cosy, the group ran a total of 27 miles in an hour. 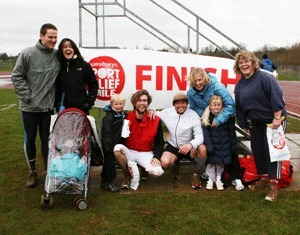 They raised over £300 which Comic Relief will use in their valuable work in the UK and abroad. A big ‘well done’ to them and to any of you that participated in money raising activities. Maybe next year we should organise a huge egg and spoon race? Chickens to help us survive in the future! The eglu is one of the main exhibits in the Science Museum’s summer eggcibition called the ‘Science of Survival’. The exhibition is set to be one of the most eggciting and thought provoking family attractions of the year, exploring how we will survive on a changing planet. Through interactive games and tasks you can discover innovative ways to find water, design a new superfood, create your personal eco-vehicle and build a sustainable neighbourhood before seeing it come to life in 2050 the Future City. A green eglu is displayed in the ‘eating’ section, as an example of the way food production may change in the future. So, a pat on the back to all you Eglu owners – you’re 42 years ahead of time! The exhibition will be running until November 2nd – don’t forget to wear your Omlet T-Shirt and jet pack when you go. Thank you to all those that had a go at cracking the cryptic crossword we published in the February newsletter. You clever-clogs have given James a run for his money and your chicken related intelligence has been highly commended by the Omlet team. Congratulations to Poet who was the first to answer the crossword correctly, you will be receiving a £20 voucher to spend in the Omlet shop shortly. The second place winners were Nicola Howarth and Paula Murray, who will both be receiving a £10 Omlet voucher. (Unfortunately we do not sell crossword books!) Well done to Alan Rowe, Susan Bromiley and Nicola Flood for your correct entries too, you haven’t won prizes this time but why not have a go at this issue’s competition? This is what happens when you feed your chickens Smarties. and this one has been altered by our team of top eggspionage agents. Can you spy the nine differences? With rumours that the waiting list for an eglu is getting longer customers are advised to book early. are used to train sheep dogs. And they haven’t even laid an egg yet! Getting an eglu and chickens for your birthday is very eggciting. P.S. We will be exhibiting in the Grand Designs Live London show again this year. For those who havn’t been before it is a brilliant day out for anyone interested in home, garden, design and shopping. The show will be running from 3rd – 11th May at the London ExCel, and the Eglu will be in the Garden section on stand G105. For more info and to buy tickets visit their website and we hope to see you there! Chickens to me are about one thing. Eggs. And I do love my eggs! Boiled, poached, scrambled or fried, as long as I can eat them it doesn’t bother me. Eggs are the culmination of millions of years of evolutionary perfection and represent the gold standard of sustainable food production. Chicken food and kitchen scraps go in, eggs and wonderful fertiliser come out and so the whole process can start again. Barbara, on the other hand sees them more as pets and dotes on them constantly. She loves those little critters with all her heart…I sometimes think she favours them over me, goodness knows why. I once caught her feeding them bits from my vegetable garden! I don’t mind the odd lettuce leaf, but my prized strawberries? The cheek of it. They do, however, occasionally get a bowl of ‘Tom’s secret recipe chicken chow’, guaranteed to perk them up and get them laying again if they have gone through a moult or are just a bit under the weather. I would share it with you now but I’m thinking of entering it as a business idea on the next series of Dragon’s Den. Barbara insists on collecting the eggs ( she seems to think she has a more gentle touch) and we use them all the time, whether it be bacon and egg tarts or lightly poached, served on bagels with a sprinkle of grated cheddar for breakfast, I couldn’t live without them. The sunshine orange yolk dripping down my chin, they are simply the most delicious thing in the world. We give many away to neighbours, family and friends, but with six chickens laying up to six eggs a day I’ve been roped into coming up with some eggy recipes. 2 extra large eggs (our girls lay whoppers)!! 3. Mash the bananas and mix with the eggs, add the carrot. 4. Mix wet and dry ingredients together until well integrated. parchment. My tin is 22cm x 11cm x 8cm deep. 6. Bake for 1 hour/1 hour 10mins or until a skewer inserted comes out clean. 7. Leave to cool slightly on a wire tray then remove from tin and enjoy! Extra good with a dollop of creme fraiche! So good, in fact, a piece of this keeps Barbara quiet for a while. Your occupation: Owner/Director of a conference venue finding agency. Where and with who do you live? Wellesbourne, Warwickshire with my husband of nine years Marc, four hens and a tank of tropical fish. What time do you get up in the morning? 7- 7.30am. What sort of shoes are your wearing? If I am not in pink Crocs I’m in knee length black boots or my wellies. What’s your greatest extravagance? Holidays. Do you have a hobby or a hidden talent? Gardening – I love pottering in the greenhouse at 7am on a Sunday with the chooks for company. Who would play you in a movie of your life? Whoopi Goldberg. What song do you most like driving to? Bat out of Hell by Meatloaf. What’s the naughtiest thing you’ve ever done? Completed spoof enquiry forms (with my accomplice Trickster O’Kane) while attending a sales exhibition and sent them to work colleagues –some even made it onto the company database eg – Miss Ellie Fant from Hull Zoological Society, Mr G Raff require a meeting room with a 4m ceiling height, Phil Yapants from The Incontinence Society, Mr P Bear from One Hundred Acre Wood.